The Commission on Higher Education (CHED) has recently awarded the TAU-DIAL EDSA project team PhP 10 million as a continuing education program grant to carry out the capability enhancement for the said program. Said budget for the five-year endeavor will reach to PhP 150 million in the development of this program at three different project sites: TAU, Don Mariano Marcos Memorial State University (DMMMSU) in Bacnotan, La Union, and Pampanga State Agricultural University (PSAU) in Magalang, Pampanga. To be implemented in collaboration with the Israel Embassy, the DIAL Program is an offshoot of the successful internship program of Filipino agriculture students in Israel, which is participated in by 30 SUCs in the country with more than two thousand recorded interns for the last nine (9) years. Eyeing to increase farm productivity and ensure food security in support to the programs of the government along agricultural development, proponents of the DIAL program from the three project sites crafted a comprehensive strategy to address these concerns. According to Dr. Tessie E. Navarro, TAU Vice President for Research, Extension and Training (VP-RET) and member of the DIAL project team, this undertaking will contribute to the acquisition of knowledge and skills in the honing and exposition of OJT students in Israel. The project also intends to create greater sustainability in farming systems to advance rural development. “The attainment of this target is largely anchored in establishing an enabling environment to better equip the students with the applicable scientific methods, hands-on experience and practical skills on Israel agricultural technology,” Dr. Navarro said. The VP-RET also explained that part of the project’s objective is to establish three (3) state-of the-art Practical Training Centers as a venue and facility that shall advocate and showcase at least five (5) Israel agricultural technologies per year/SUC; to capacitate five (5) faculty/researchers on Israeli technologies and to conduct at least five (5) crop-based research per year per SUC; and, to provide technical assistance and support to at least 10 organized farmers group/ POs by undertaking at least four (4) extension and training activities to at least 250 students and 500 farmers per year/SUC. 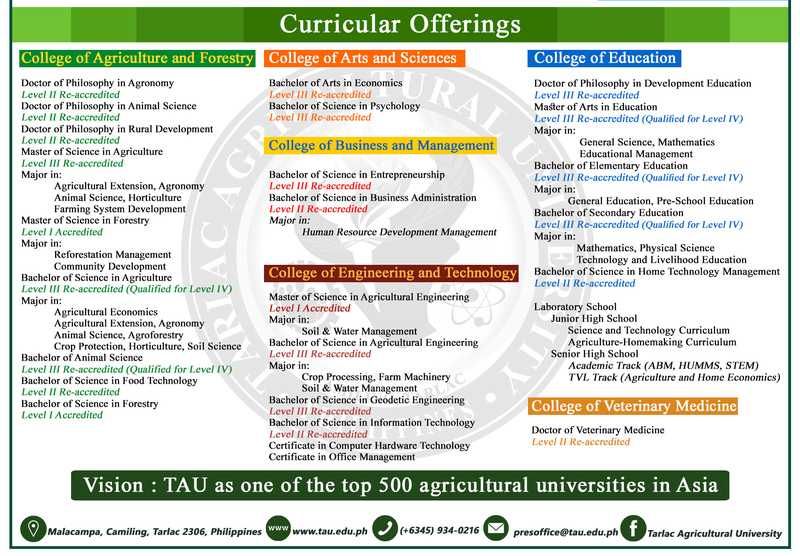 Moreover, it intends to showcase and apply the agricultural training experience of at least 10% of OJT students from AgroStudies in Israel, and to establish/showcase at least one (1) in-campus and one (1) off-campus income-generating techno-demo farms/SUC. Meanwhile, Dr. Yolanda S. Guillermo, TAU’s Director for Extension and Training (E&T) and also a member of the project team, further disclosed that one of the components of the DIAL-EDSA project is the conduct of trainings that will develop skills in organizational leadership, innovative and coordinated approaches, credibility and team building, and workable linkages for synergism and complementation of services that enhances strong cooperation and self-reliance. “Faculty and staff who will be directly involved in the implementation of the Development of an International Agro-Technology Lighthouse (DIAL) Program need to undergo capability enhancement to be more equipped and prepared before they take their turns as resource persons and support staff to a larger group of target participants who are the faculty and non-teaching staff, students, farmers, entrepreneurs, women, OSYs and officers and members of people’s organizations,” the E&T director stressed out. Various government agencies, industry partners, and provincial and local government units also expected to take part in the implementation and completion of the DIAL program.